The MDA Series of machines are designed to perform various tasks in a pre-hanging and entry door line. These machines can be mixed and matched to suit your company’s machining needs. 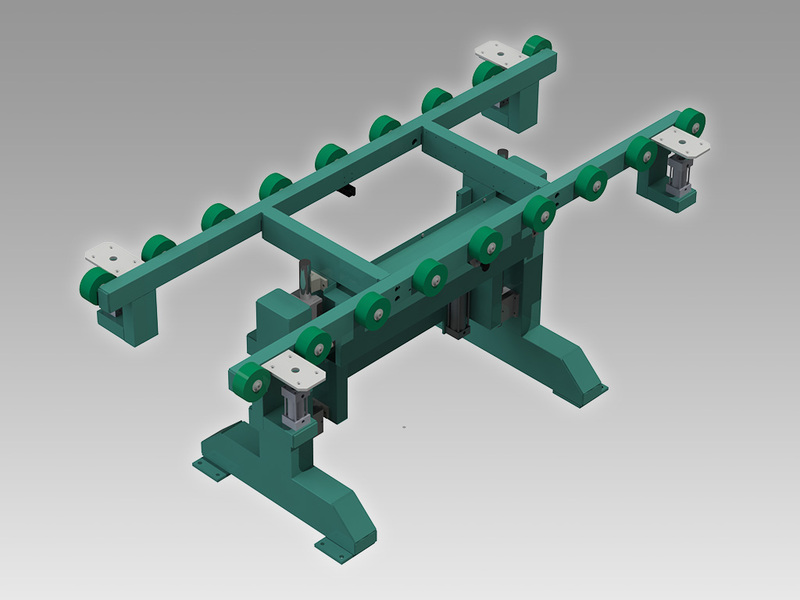 The MDA-1 assembles hinge jambs to a door slab once the door is rolled into position it is clamped into place for hinge application, which can be done to either the left or right-hand side of the door. In normal operations the hinges are applied to the jamb off-line. The design of the table supports doors ranging from 2’6” to 3’0” on parallel rows of urethane wheels. The base model includes four 12’ coiled air lines plumbed to a built-in Filter, Regulator, Lubricator unit for quick attachment of air tools. Eight Acro Bins are also included for quick-access hardware storage. The MDA-3 applies casing and finish packaging to doors the table design supports doors ranging from 2’6” to 3’0” on parallel rows of urethane wheels. The inner gap between the wheels also accepts doors with lights installed up to 25” wide at the outside of the light frame. The assembled door unit is tilted to a near vertical position for easy off-loading by simply depressing a foot pedal. The MDA-4 upright door stand makes installing bracing and packaging to the inside of finished doors quick and easy. Upon reception of a finished door that has been raised to a vertical position by an MDA-3 the support side of the MDA-4 is positioned such that the exterior side of the door will lean against non-marring plastic slides, where it is then smoothly transferred to the MDA-4 on ball bearing rolls. The door is tilted forward so its exterior side is resting against the plastic slide. The interior side of the door unit is then completely open to enable the operator to apply protective bracing and packaging. The MDA-4 accommodates doors from 2’6” to 3’6” wide and up to 8’0” high. The MDA-6 is used to apply protective bracing and packaging to door exteriors. The table design supports doors ranging from 2’6” to 3’0” on parallel rows of urethane wheels. The inner gap between the wheels also accepts doors with lights installed up to 25” wide at the outside of the light frame. The assembled door is then tilted to a near vertical position for easy off-loading by simply depressing a foot pedal. The MDA-E makes it easy to apply brick mold casing to the exterior of doors the table is designed to support doors ranging from 2’6” to 3’0” on parallel rows of urethane wheels. The inner gap between the wheels also accepts doors with lights installed up to 25” wide at the outside of the light frame. The assembled door unit is then rolled into the next work station for finish packaging. The base model includes four 12’ coiled air lines plumbed to a built-in Filter, Regulator, Lubricator unit for quick attachment of air tools. Acro Bins are also included for quick-access hardware storage. The MDA-M is a feed table for steel or fiberglass entry doors ranging in width from 2’6” to 3’0”. The framework is fabricated from heavy steel tubing supporting 4” diameter urethane wheels spaced in two rows 25½” apart. The wheel configuration allows doors with door lights installed to easily transfer between work stations. With available options the MDA-M can be configured to create a specialized work station.